I first have to thank Little Danny over at Office Naps for turning me on to this one a while back. It took me a while to score this one, but it was worth it. 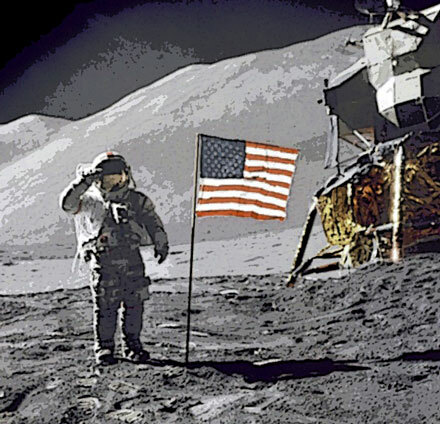 If you spend enough time rummaging around in piles of records, or if you are old enough to remember the moon landing in 1969 (which I am, sort of) you’ll know that it was something of a huge deal, and this was manifested partly in a bunch of progressively weird(er) records. Some of them were just cash-ins/rehashing of news audio type things, but some of them, like today’s selections, were actually good music, too. 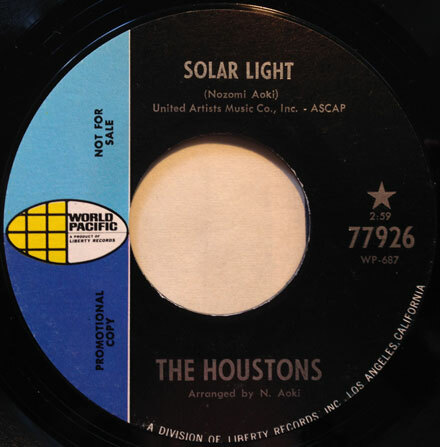 The Houstons (as in ‘Houston we have a problem..’) weren’t a real group in the classic sense of the word. The music on this 45 was the work of Japanese film composer Nozomi Aoki. ‘Solar Light’ is for 1969, decidedly 1963/Joe Meek-ish in that weird Tornadoes/Shadows/Thunderbirds Are Go way, drenched in tremelo, reverb and sound effects, in other words, super cool. The flip side, ‘Sea of Tranquility’ (named for the crater on the moon) is one of the as strange as the A-side is conventional. A weird, experimental soundscape, with what sounds like tape manipulation, and piano and organ noodling. I can just imagine some kid picking this 45 up at a department store and having their mind blown. I notice you occasionally play Lynn Castle – particularly ” Rose Colored Glasses”. I thought you might like to know she is still writing music and recording a new album under the name Madelynn Von Ritz. She is a close friend of mine and more talented than ever. If you are interested in contacting her, her phone number is 818-396-4055. I can be reached at 818-388-4640.